I love side-by-side comparisons. 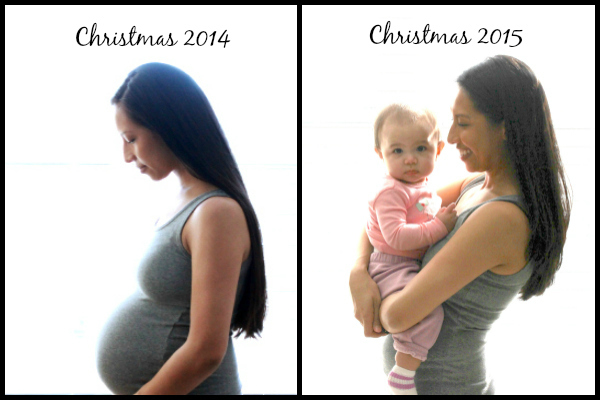 Last Christmas I was almost 32 weeks pregnant. This Christmas I was chasing a ten-month-old. Next Christmas I'll be painting and cutting snowflakes with a toddler. So much changes in just a year's time! We agreed that Christmas will be different next year, because Presley will have a better understanding of it all and will want to join in the fun. Where ever you are, whatever you celebrate, who ever you spent time with -- I hope it was wonderful. Pres is adorable and so are you! I miss you so much sis! I love the photo! It is always so fun to see where we all have come in a years time. I can completely relate with the loneliness that the holidays can bring, since I haven't been able to celebrate with my family in over 4 years. I can completely understand celebrating a bittersweet Christmas, albeit for different reasons. This was my husband's first Christmas in my hometown, and I loved sharing our traditions with him. It was also the first time since 2012 that my siblings plus our SOs have celebrated Christmas together. But it was also the first Christmas without our mom, which just made it really hard. Plus, not as sad, but still a little, is that by celebrating Christmas with my family, we didn't get to celebrate with my in-laws, including our first nephew. We skyped as a family a few days ago and did our Secret Santa exchange, but all I want to do is cuddle my nephew!